Charming semi-detached cottage with approximately one ACRE (stms) of land, with a stable block, useful outbuildings, kennels and paddocks. No onward chain. Wood shed, stable block with three loose boxes, two kennels, large outbuilding / garage with storage space and separate room to side, field shelter with fenced coral, car port, paddock, pond, front and rear garden, off road parking. The cottage is accessed over 'Ibstock Farm' driveway, where the property has a pedestrian and vehicular right of way. Halesworth 3.7 miles; A12 Darsham 2.6 miles; Southwold 10.7 miles; Framlingham 12.4 miles. 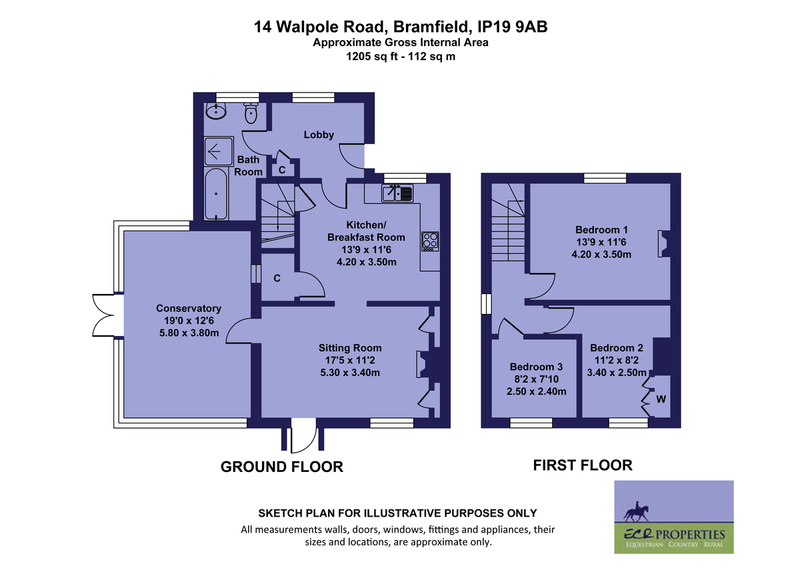 Bramfield is a charming village with a primary school, village hall, village church, equestrian centre and award winning Queens Head pub. The popular market town of Halesworth has a wide variety of shops, a primary school, library, arts centre, doctors surgery and a cottage hospital. The town is also well served with transport communications having a railway station which offers a service via Ipswich to London Liverpool Street. Southwold and the Suffolk Heritage Coast are just a short drive away.